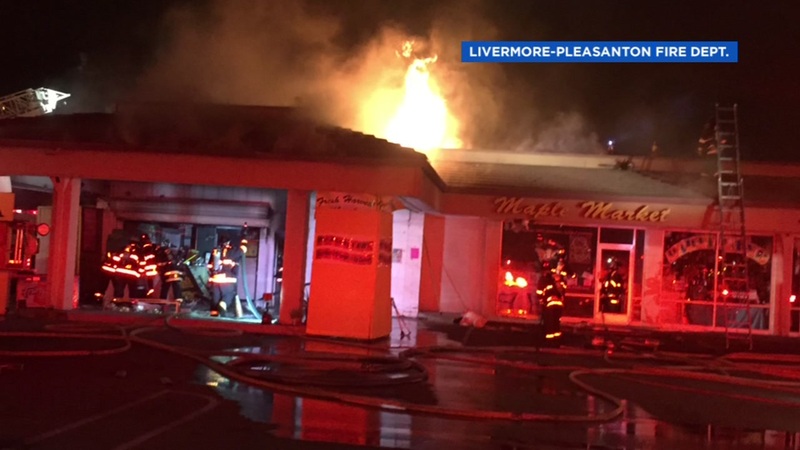 Livermore, Calif. -- A fire that broke out at a downtown Livermore market early Saturday morning caused an estimated $300,000 in damage, fire officials said. The fire was first reported at 4:07 a.m. near First and Maples streets, according to fire officials. Upon arrival, firefighters saw smoke coming from the roof of a strip mall at the location. Firefighters were then able to locate the fire at the far left of the building, where a market is located at 124 Maple Street. The fire extended into the attic area of the market, threatening the businesses next door, fire officials said. After clearing a storage area, firefighters were able to gain access to the fire. Around 5 a.m., firefighters had brought the blaze under control, according to fire officials. While the market sustained heavy smoke and fire damage, neighboring businesses only sustained minor damage, fire officials said. The market has been closed while the cause of the fire remains under investigation.